Johann Sebastian Bach (1685-1750) is the most revered European composer of all time. Since the 18th century he has been praised by by the leading composers and a host of contemporary musicians. 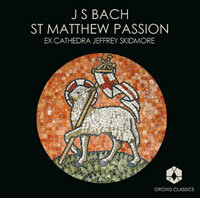 St Matthew Passion is his most extended work and is supremely rewarding to study, rehearse and perform. It is a musical icon for the Christian world but at the same time expresses feelings common to the whole of humanity. Recorded live at Symphony Hall, Birmingham, on 10 April 2009 (Good Friday) by kind permission, this recording is sung in English, using a new translation by Nicholas Fisher and John Russell. The recording was made possible thanks to the generous support of The Grimmitt Trust. 32. Chorale: How falsely does the world accuse!